Make a fine paste by grinding onion, garlic and ginger in the grinder The paste should be smooth. Remove the leaves and stem of the cauliflower and cut it into pieces . Peels off the potatoes and cut into pieces. Peel the green peas. Finely chop the tomatoes and coriander leaves. Heat oil (3btps) in a pan, add cauliflower and salt as required and fry till it turns light brown, then take it out of the pan. Again heat oil (1btps) in the pan. Fry the potato till the colour turns golden brown and take it out of the pan. Heat the rest of the oil in the pan and add the prepared paste . Add turmeric powder, chili powder, cumin powder , coriander powder to it. Fry the paste by adding water with frequent stirring over medium flame till it turns light brown. Add the tomatoes and stir well. 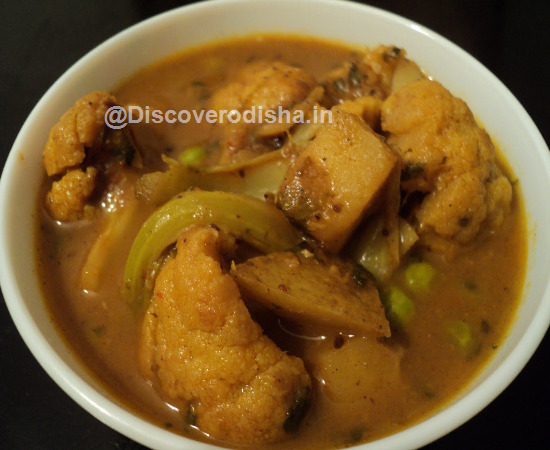 Add the fried cauliflower, potatoes, green peas and mix them properly. Add 3-4 cups of water , salt as per taste , mix it and cover it with a lid. Boil it on a lower flame, for another 15 minutes till the vegetables are tender and the gravy thickens to the desired consistency. Then remove the curry pan from the flame, garnish with finely chopped coriander leaves and serve hot.